Discussion in 'Gambling News' started by Kotsy, Jun 2, 2014. Can you believe Win A Day Casino has been Online for 6 years already? comp program and great promotions makes the time fly by. I’ve always loved Win A Day Casino for their incredible customer service and promotions. Did I mention they are USA friendly? I’ve never had an issue with depositing and my withdrawals have always been processed according to their time frames. I just love this place. Now let’s celebrate their 6th year Birthday with some incredible Birthday surprises and more. Make sure you can utilize all that is offered for the month of June. All loyal players that have made a deposit within the last 30 days can get in on the full action. range of promotions available to you. Let the Birthday Bash begin! All players will have a chance to celebrate with the release of 3 new games, some incredible Mobile action, Game of The Month and more. It’s going to be a huge celebration in June. It’s not only about cake and candles, it’s all about the celebration of Win A Day Casino and they've made sure to include all players. you’ll earn tickets into a draw that is worth up to $1,000 prize pool. 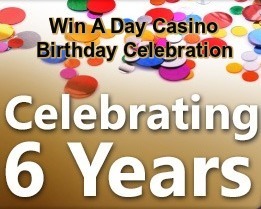 Celebrating the 6th Birthday at Win A Day Casino brings a whole new meaning to their Daily Tournaments. A whopping $21,600 can be won. Log in and see what tournaments are offered. Keep your eyes open for many presents for their loyal players. You never know when that present will pop up to give you something special to unwrap. It’s sure to be a huge celebration at Win A Day Casino for June. Bonus Paradise is so glad to celebrate it with you. momdad, Ellis, Marina and 1 other person like this. Whoohoo thats great news! Happy birthday Win A Day Casino!